View cart “Unremembered Special Edition DVD” has been added to your cart. This is a limited, numbered autographed copy of the award winning film special edition DVD. This is a limited, numbered autographed copy of this Special Edition DVD. 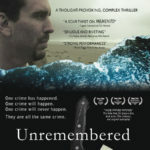 Unremembered (Indie Fest and Accolade award winner, feature film) is a complex thriller told in non-linear time about a man who has no past. It follows the alternate reality journey of John Outis (Tim Delaney, Indie Fest award winner, lead actor) over sixteen days as he tries to restore his fractured life history. But the more his dark past comes into focus, the more the lives of his friends, his wife, and his lover are altered. DVD back panel. Click to see larger version. Made in Portland, Oregon. Filmed entirely in Oregon. A modern interpretation of the Greek epic, The Odyssey. The film contains adult language, violence, adult situations, and complex ideas.